Even if it feels like it isn’t, the tide is always turning. If it’s low, it will inevitably become high. If it’s high, it will eventually be low again. The only thing that never changes is that everything changes! Just keep creating from what you have until it does. Things will get better. You will find the answer. You will discover the solution. You will get to the other side. 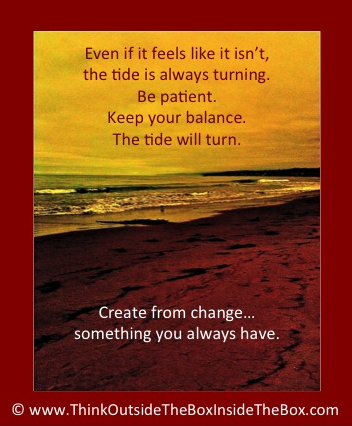 It is important to practice patience and keep your balance as you weather the turning tides. Create from change—something you always have.